The Saudi Arabian-led assault on Yemen has disrupted life-saving aid programs across the country, international aid agencies have said. The provision of humanitarian aid to many Yemeni regions was already difficult as the country has slid closer to civil war following the takeover of the capital Sana’a in September by northern Houthi rebels. But on Thursday morning, a Saudi-led alliance of eight countries began bombing key Houthi targets in Sana’a and other cities. Since then the United Nations and other aid agencies have been forced to suspend many key programs. International NGOs and the UN are seeking to evacuate their international staff, with several hundred still in the country. All commercial flights out of the country have been suspended since the Saudi attacks began. Trond Jensen, head of the UN Office for Coordination of Humanitarian Affairs in Yemen, said he was “extremely concerned” that vital aid was being suspended across the country. “In a conflict our ability to stay and deliver is badly affected,” he said. 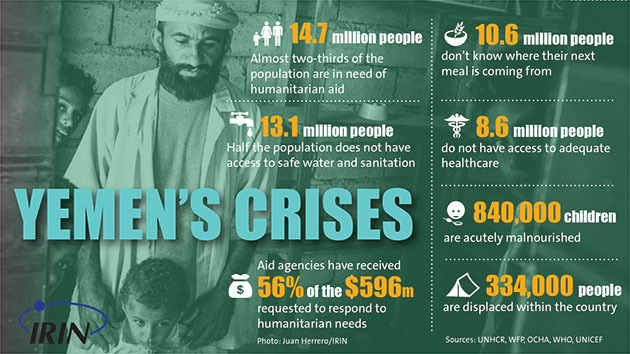 Yemen, which has a population of just under 26 million, is the Arab world’s poorest country. Almost two-thirds of the population was already in need of aid before the crisis, while over 10 million are food insecure. The Houthi takeover had already led to the suspension of key financial support to the country, while millions of dollars of development aid was suspended. Jensen said that the country’s dire economic situation was likely to be made worse by the suspension of key humanitarian aid. “Vulnerable people will be pushed over the edge,” Jensen added, agreeing that the country was in a perfect storm of crises. He said, however, that the UN would seek to continue to deliver some humanitarian aid remotely. Haajir Maalim, country director at Action Against Hunger, said they had suspended all operations in the northern regions of Hajjah and Al-Hudaydah and Abyan and Lahj in the south over security concerns. He added that they were seeking to maintain some services to ensure thousands of vulnerable people were not cut off from support. He added that they, too, were seeking to evacuate their international staff, while those that remain in country would be more restricted in their movement. Maalim said he was wary that aid workers could also become targets for criminal gangs as the conflict continues. As fighting intensifies, there is little indication that any side is focusing on the humanitarian suffering in the country. The leader of the Iranian-backed Houthis has resorted to increasingly fiery rhetoric in the face of the attack, while the internationally recognised President Abdu Rabu Mansour Hadi called for the Saudi strikes, which have led to the killing of civilians. A report released on Friday by the International Crisis Group think-tank warned that all sides were currently unwilling to search for a negotiated settlement and on Friday night, eyewitnesses in Sana'a said there were fresh airstrikes in the city. “We are concerned that whatever resources are left in the country shall we diverted to conflict,” Jensen added.